WITH the Pilipinas Aguilas trailing the Western Australian Raiders 26-0 at the start of the second half of a friendly, the Philippine team did something it has longed to do since it was formed. The Aguilas pulled it off when wide receiver and playing coach Ivan Klaric received a long pass from quarterback Pereme Alina and raced 30 yards to the end zone to score the team’s first ever touchdown. The roar of a passing 747 on final approach over the Emperador Stadium in McKinley Hills drowned out the cheers of the crowd of around 400 who witnessed the the first-ever American football international on Pinoy soil. “(The touchdown) a big load off our back, its shows we have what it takes,” said Aguilas chairman Apollo Angco afterwards. The 56-7 final score, however, provided a sobering reality check for the Filipinos entering the competitive world of tackle football - a game only seen locally on TV through the NFL or video game consoles. But Angco admitted that they are making lemonades with whatever is available. “We have to pick from just 300 to 400 guys compared to other programs where they can choose from thousands of recruits,” said Angco, who nonetheless believes the time is ripe for the country to pick up the sport. 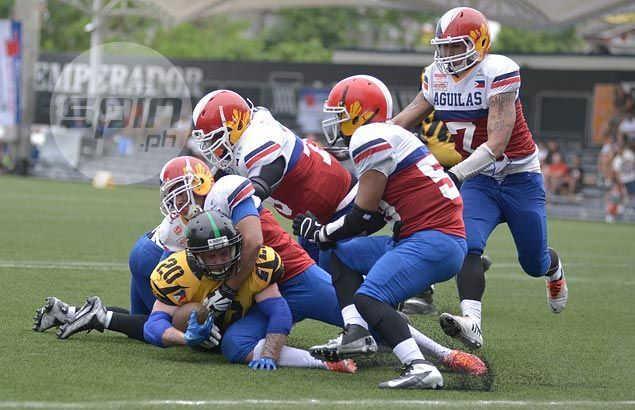 “No shutout today!” said burly Aguilas offensive lineman CC Cocjin as he looked back at the Aguilas’ first international held in Tokyo last April where the Filipinos got clobbered 0-86 by Japan in their 2015 IFAF World Championship qualifier match. Cocjin said they have a lot of work to do. He said these types of matches provides them with much-needed experience to season a team composed mostly of guys who learned the sport from Youtube and video games. “Locals get one big hit and they’re like celebrating. (The Raiders) drive through and that’s what we have to learn - keep contact, drive through the contact and make sure you get your angles right,” he said after the match. A fitting symbol of the Aguilas cause was Karl Fernandez. The 5-2, 120-lb. running back was praised by both sides for his grit and determination. “I want the opposition to underestimate me so when I show them my stuff they’d be surprised by what I can do. It’s all about heart,” he said. The lack of experience, however, showed as the Filipino players struggled to find a rhythm the entire game. Numerous yellow flags were called on the Pinoys. Raider quarterback Gareth Wienbrecht, who scored three touchdowns and named MVP of the game, shared his observations. “This is the most fun game I’ve been involved in. The Aguilas aren’t too bad. We just had more guys with a bit more experience. They had some nice tackles. Their coverage and their receivers were quite good,” Wienbrecht said. American wide receiver DJ Maristela also scored three touchdowns for the Raiders. The Detroit native said he was invited by an Australian friend in Korea to play with the Raiders. The Koreans, incidentally, will face the Aguilas next year in another friendly. A perfect script for the Pilipinas Aguilas.